Magento is one of the most widely used E-Commerce platforms and Content Management system. Magento took the digital world by storm because of its efficient features and really awesome design functionalities. Magento 2 was introduced as the revised version of Magento and has proven to be great just like the first version. With a great level of functional features and flexibility, this platform really became the personal favorite of a large number of web developers around the world. It offers great amount of scalability and finest levels of customization to even create each element of website according to your wish. Magento 2 has changed the way website development used to be done as you can utilize thousands of extensions available to add any type of functionality to your E-Commerce website. Magento 2 offers hundreds of themes available which makes it quite difficult for you to choose from the long list. This is one of the most widely used themes in Magento 2 as this is quite responsive theme which looks awesome on all screen sizes. This themes allows you great level of customization to its developers and users, making it quite efficient. This theme can easily help you in developing any type of E-Commerce store whether heavy or light like, digital store, hi-tech store, watch store, men store, women store, clothing store, furniture store, book store, cosmetics shop, luxury jewelry and accessories store. 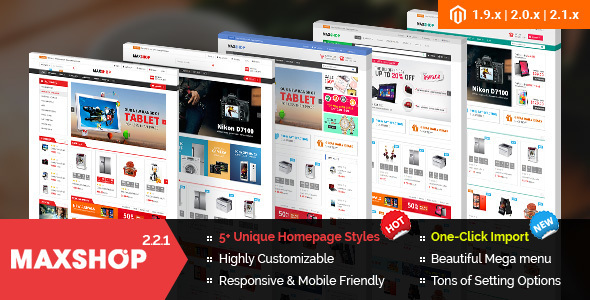 This theme is compatible with Magento version 1.7 to 2.x and offers more than 8 homepage layouts for you to choose from. You can have any type of menu between these two – Mega Menu and CSS Menu. The layout utilizes AJAX platform which help in avoiding page refresh while adding item to wish list or cart. This theme is SEO optimized, making it a great choice for your E-Commerce store. If you have a business of fashion apparels and footwear or you wish to endorse and sell fashion products of other companies through an E-Commerce website, you will have to use a theme that meets all your requirements. 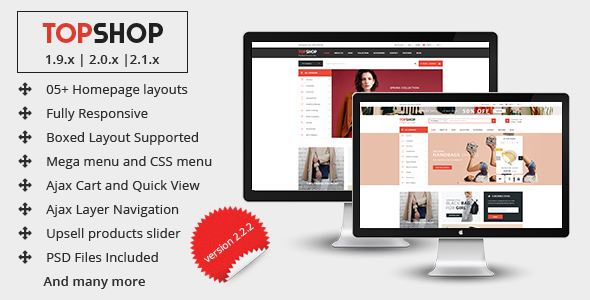 For this purpose, the Topshop theme was created which allows you to design a responsive website which works perfectly and also looks great in devices of all screen sizes. This theme is really customizable and allows the users to use it perfectly. This theme allows you to add .PSD files for outstanding graphics. 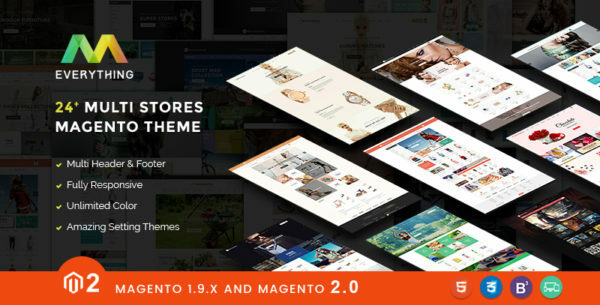 This theme is compatible with Magento 1.9 to 2.x. This theme supports navigation through AJAX layers and use Google rich snippets. The theme is completely responsive and allows you to import data with one click only. Thus, this is a quite awesome theme for you. This is a quite awesome theme for your online store to sell any types of products. This theme provides you with great level of responsiveness so that your website works perfectly in all devices with any screen size. This theme has a very unique layout and a lot of other essential features of Magento. 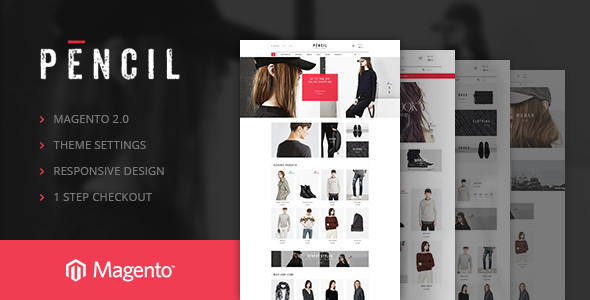 This theme is compatible with Magento 2.0 and above. This theme supports AJAX functionality which helps you to add products to wish list and compare with other products without the need to refresh the page. This theme supports Mega Menu and CSS Menu. The layout of this theme is fully responsive and is totally optimized for SEO, making this profitable for your E-Commerce business. This is one of the most prominent themes available today for your E-Commerce website. This theme provides you with very efficient responsiveness, which results in creation of the finest professional looking, elegant and product-oriented website design. This theme has been specially designed for Magento 2 and has proven to be a great factor for increasing the performance of website and enhancing business sales. This theme is compatible with Magento 2.0 and above. This theme allows you to have a one-page checkout which helps in enhancing the user experience. This theme can be installed very easily and the vast level of customization to developers. The quick view option lets the users to have a quick look at the products right from main products page for better shopping experience. Another very famous Magento 2 theme is the Furnicom theme, which provides your E-Commerce website with a lavish, elegant & professional look. This theme offers a very responsive design which works best on all screen sizes. This theme supports five homepage layout styles that work awesome for various furniture stores and interior designing websites. 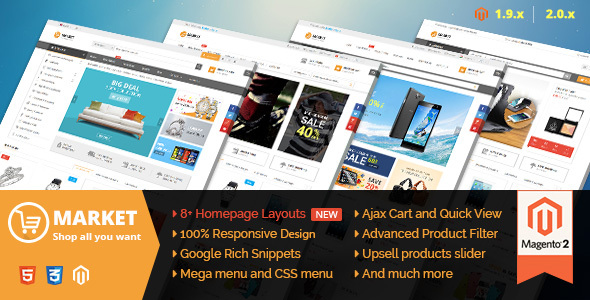 This theme is compatible with Magento 1.9 to 2.x. This theme supports Mega Menu and CSS Menu. You can easily display the products separately that are best sellers and the featured products too. Use of Google Rich Snippets and integration with Cloud Zoom, makes this theme quite a good option for your E-Commerce business. 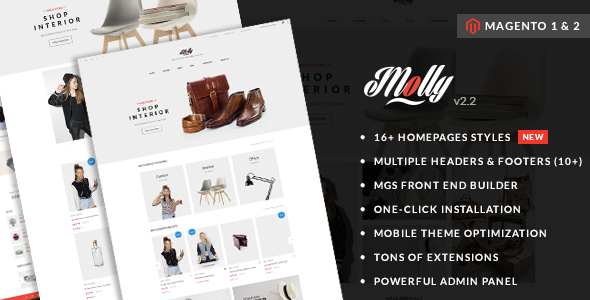 Molly is one really flexible theme of modern day that supports the integration of blogs and other useful pages for developing high performance and elegant web designs. The website looks uncomplicated and stylish at the same time. You can create any kind of E-Commerce website with more than 10 homepage styles available with this theme. This theme is compatible with Magento 1.7 to 2.x. You can easily integrate .PSD design for a crispy graphic rich website. The Mega Menu and Google Rich Snippets make your website way better. This theme offers responsiveness & one page checkout service to ensure better user experience. This is another masterpiece theme available for your E-Commerce website as this theme supports five homepage styles and color styles. This theme can make your E-Commerce website look great making it convenient for any type of business like clothes to electronics. 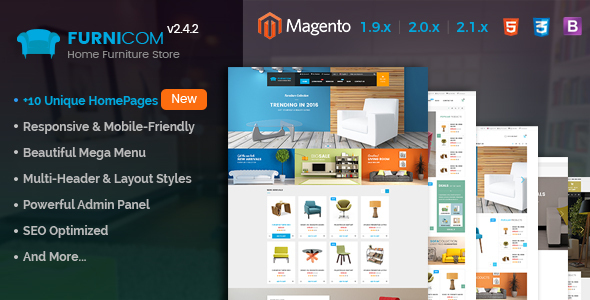 This theme is supported in 1.9 to 2.x Magento versions. This theme is very easy to install and allows you to integrate blogs in different layouts. You can even show videos on your homepage. This is a really renowned Magento 2 theme, which allows you to integrate more than 10 homepage styles in your business E-Commerce website. This theme is quite easy to install and has endless number of options available for administrators for proper control of your website. This theme allows you to have advanced theme functionality and a slider for more effective display of products. You can even display videos one your homepage and even integrate different type of blogs. 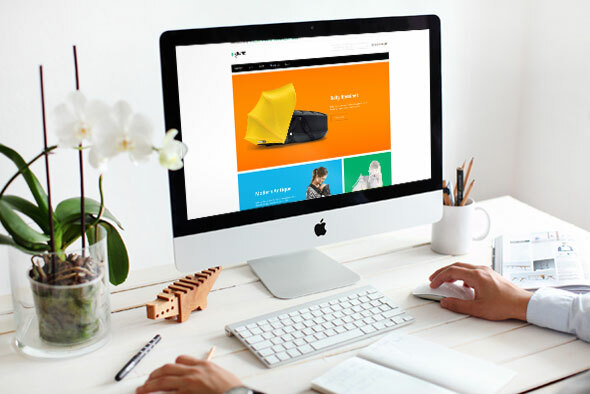 This is a full featured theme that allows you to have many additional features that are quite essential for a perfect E-Commerce website homepage. The additional features include Off Canvas Menu & Header Link, Font Awesome, Ajax Cart, Gallery image product detail, and Checkout Improvements. Moreover this theme is available free of cost so this is an added advantage. 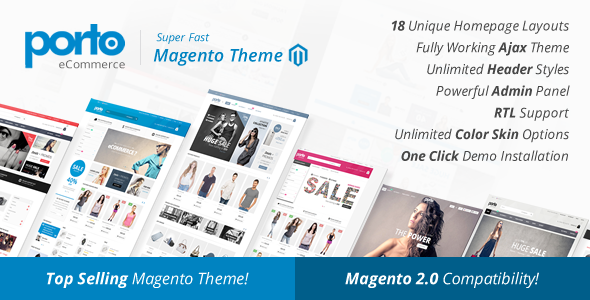 This theme is supported in Magento 2.0 and allows its users for one page check out. This theme can be easily installed and the customization is also very simple and effective. Quick view of the products and off canvas menu adds to the awesomeness of this theme. This is a wonderful multipurpose theme that can be used to design a website of any forte like fashion, accessories etc. This theme allows a great level of customization through 4 homepage layouts. With the compatibility with Magento 2.1, this theme allows you to add blog extensions & many other dynamic features to your website. This theme is responsive which helps the website look elegant on all screen sizes. You can even design you own theme by customizing it with ‘n’ number of colors available. This theme provides you with advanced search functionality to filter products according to various attributes like size, brand or color. 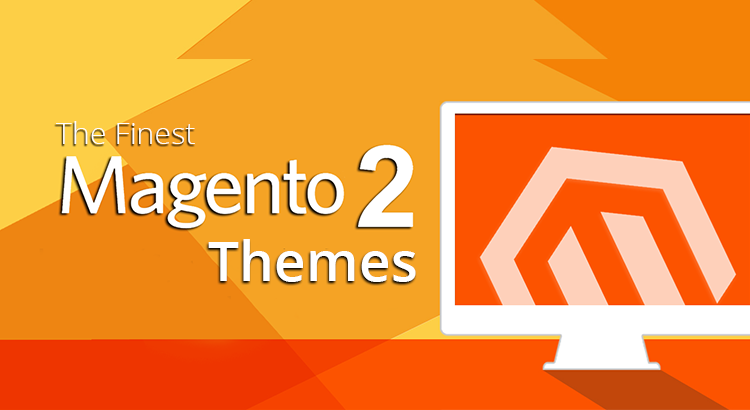 This is also one of the top Magento 2 themes available today. This theme has an eye-catching design and can be used to create any type of E-Commerce store like fashion, accessories, gift shop, groceries, jewelry and so on. This theme is quite responsive as well. 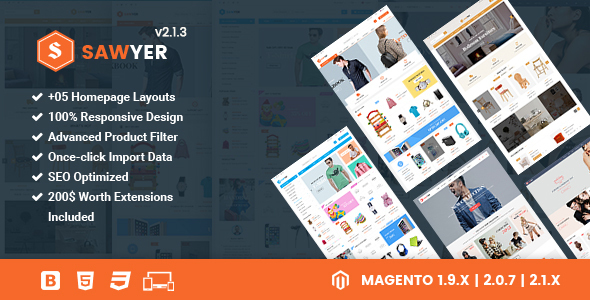 This theme is supported in Magento 1.9 to 2.1, allowing a great level of customization. The Ajax Layer navigation and options of CSS Menu and Mega Menu make this theme quite great. This theme even supports multiple languages and currencies. This was one of the earliest Magento themes, which provides you with a perfectly responsive web design that looks marvelous on all screen sizes. This theme provides you with many additional features like cross-browser support, slider, configurable swatches, Ajax cart, product zoom, improved checkout, and a user-friendly admin panel. This theme is supported in Magento 2.0 and is very easily customizable. The cart has been designed using AJAX for adding product with a click without refreshing the page. The administrative panel is quite easy to understand and control. Thus, these are the top Magento 2 themes available today that you can utilize for your E-Commerce website. These themes have been chosen as the top ones after thorough research and developer reviews. So just select the one you find most suitable and have the perfect website designed for your business.